One of the latest vehicles to join the large contingency of cars that will be on display during Summit Racing Equipment Atlanta Motorama was recently unveiled at a ceremony at Summit's McDonough store. "It's been a real honor for us to have the car in the store," said Steve Kester, the manager of Summit Racing Equipment's store in McDonough. "We've had it in the store for about a week and our customers were able to come by, take a look at the car, and guess what it is. It's been exciting." After an agonizing week of the car's identity being shrouded in mystery, the cloak came off to reveal a stunning 1969 Chevelle SS with eye-popping red paint, black racing stripes, and a sporty front end covered in chrome. The reveal came after more than three years of restoration work to transform the old Chevy into a magnificent piece of machinery. "When I got the car it had been partially restored. It was sort of a halfway SS clone and it wasn't anywhere near being right," said David Hamilton, the car's owner. "It was drivable, but it was rough - very rough - and it was my goal from the beginning to eventually put it back brand new." "It was a long build, but a complete build," said Mark Engel from Atlanta Auto Restoration, which was tasked with the restoration. "Everything frame off - nut and bolt - a lot of parts of course through Summit." Everyone on hand to see the car's unveiling at Summit Racing Equipment was struck by the car's beauty from the moment the cover came off. "It's exactly what I wanted. I got the color I wanted; I'm a red car guy, I've been a red car guy my whole life, and the paint's just beautiful," said Hamilton." "The color is just stunning," added Kester. "It will definitely pop when it's at Summit Racing Equipment Atlanta Motorama. The thing I like about it, too, is the wheels on the car. I like the old-school Cragars. I think it's a good look for the car and period-correct for it as well." With the grand reveal complete, the Chevelle is now ready to take its place inside Atlanta Motor Speedway's infield during Summit Racing Equipment Atlanta Motorama on April 27-28. 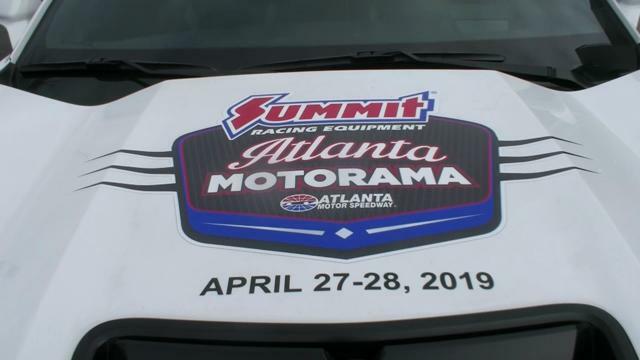 "It just brings it all together and it shows what Summit Racing Equipment Atlanta Motorama is all about," said Kester. "You'll see vendors that have cars like this complete and others that are halfway through the restoration process. You'll also get a chance to meet the all 48 vendors who were actually a part of this car while you're out there." "This car will be in Atlanta Auto Restoration's booth," said Engel. "We've had a booth there since Summit Racing Equipment Atlanta Motorama has started. It's got to be one of the best shows in the Southeast." The Chevelle will be one of more than 1,000 cars on display during Summit Racing Equipment Atlanta Motorama. Spectator tickets are priced at $15 per day or $20 for a two-day weekend pass; kids ages 12 and under get in free! Admission includes access to all areas of the show including the vendor midway, show car garage, extreme motorsports and much more. To buy tickets, register your ride, or inquire about becoming a vendor at Motorama, visit atlantamotorama.com or call Atlanta Motor Speedway at 770-946-3919.